Finding the safest and healthiest formula for your baby can be a stressful process! I’ve heard from many of you that my guide to the best organic baby formula has been helpful in making that process a bit easier. 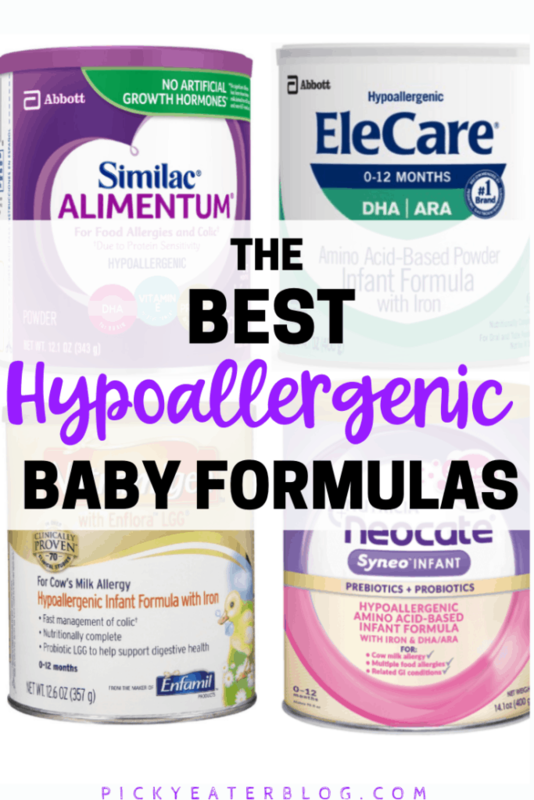 But navigating the world of hypoallergenic formulas can be even more stressful – because on top of trying to find a healthy solution, you know that your baby is getting sick from the milk protein in regular formula! I was lucky enough to have two kids who didn’t have any allergies, but I have talked to so many moms who are frustrated with the lack of options for healthy, safe, organic, hypoallergenic baby formulas. So that’s where this post comes in! 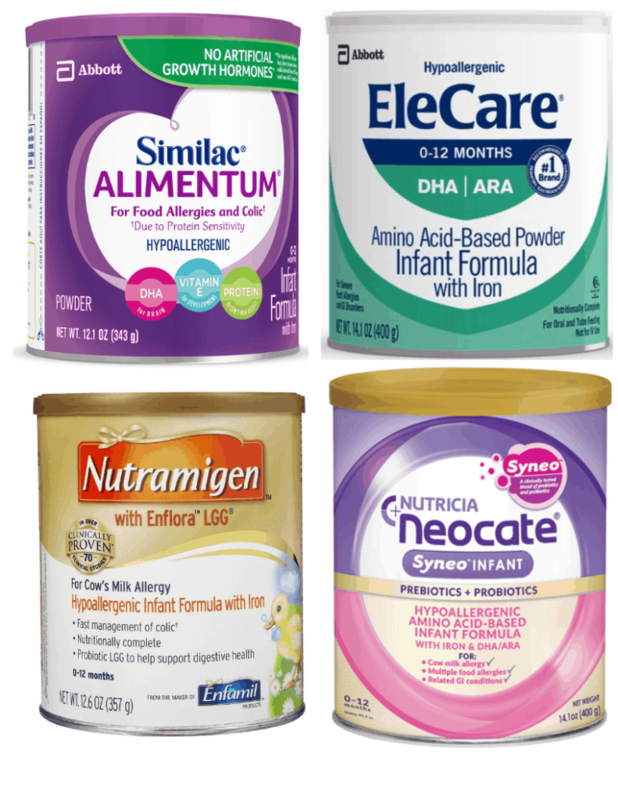 Here is your guide to the best hypoallergenic baby formulas on the market today! So to start, what types of hypoallergenic formulas are out there? And which are the best? Soy Formulas: While these are an alternative to cow’s milk formulas, 8-14% of infants with a cow’s milk allergy will react to soy. On top of that, too much soy for infants hasn’t been studied in terms of its long term effects – so I don’t like recommending soy formula, especially non-organic soy formula, for babies with a cow’s milk protein allergy. Goat Milk Formulas: This can be a good option if your baby has a cow’s milk sensitivity vs. a diagnosed cow’s milk protein allergy. For Goat Milk formulas, I’d recommend: Kabrita USA or Holle Goat (for more details on goat milk formula comparisons, you can read my post here). Partially Hydrolyzed Formulas: These take a cow’s milk protein whey and break it up into large pieces. But this can still trigger an allergic reaction in babies who are allergic to cow’s milk. Amino Acid Based Formulas: These are hypoallergenic. These don’t include whole protein molecules at all. Instead, they contain all the basic amino acids, which are the building blocks of protein. These are the most expensive and are used when babies react even to extensively hydrolyzed formula. Common and Amino Acid Based formulas in the US include Neocate® or EleCare®. These don’t have great ingredients, but there isn’t a better option that I’ve found out there! What makes the European hypoallergenic formulas far superior to the US ones? No processed or refined sugars (syrup, syrup solids, maltodextrin, sugar, brown rice syrup, etc). Minimal synthetic nutrients: this includes lutein, lycopene, nucleotides, l-methionine. I won’t go into details on each nutrient listed above, but essentially – many are processed with neurotoxic solvents or are either themselves listed as a toxic ingredient. They taste much better than the US hypoallergenic formulas! 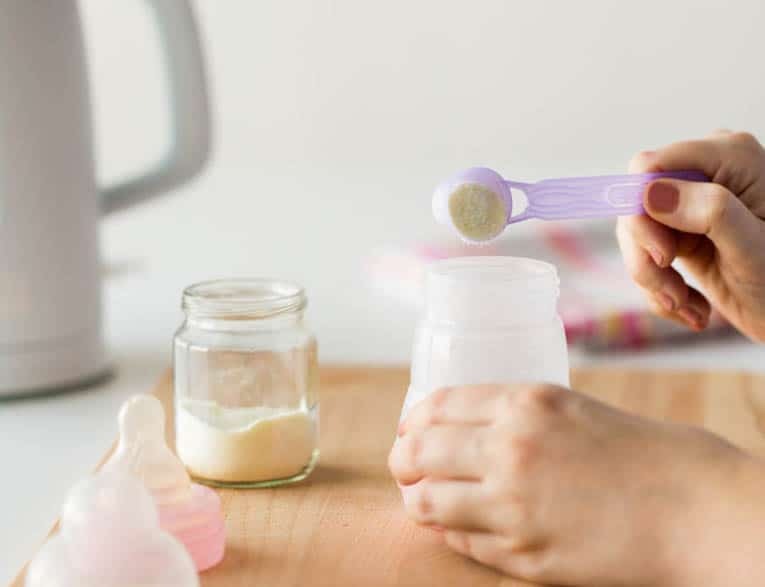 US hypoallergenic formulas are notorious for tasting and smelling horrible – and that can make it even more challenging to get your baby to drink them. But because they’re made with whole food and minimally processed ingredients the European formulas are usually well tolerated by babies in terms of taste and smell. They’re pretty comparable in price, and sometimes even cheaper than the US hypoallergenic formulas. Note: while most HiPP formulas are organic, HiPP Comfort and HiPP HA are technically not certified organic because the hydrolyzed protein is not available in an organic form. So are the US formulas really that bad? Even if you just look at the sugar content and ignore the highly processed ingredients, yes. Look at the ingredients from some of the most popular brands – and you’ll see that over 50% of the ingredients are literally just sugar. That’s just like spoon feeding your infant table sugar! It’s ridiculous. Alimentum®: Corn Maltodextrin (35%), Casein Hydrolysate [Derived from Milk] (18%), Sugar (15%), High Oleic Safflower Oil (10%), Medium-Chain Triglycerides (10%), Soy Oil (8%). If you compare that to the Ingredients in HiPP Comfort or the Ingredients in HiPP HA – you’ll see that there is zero added sugar for both of these formulas! 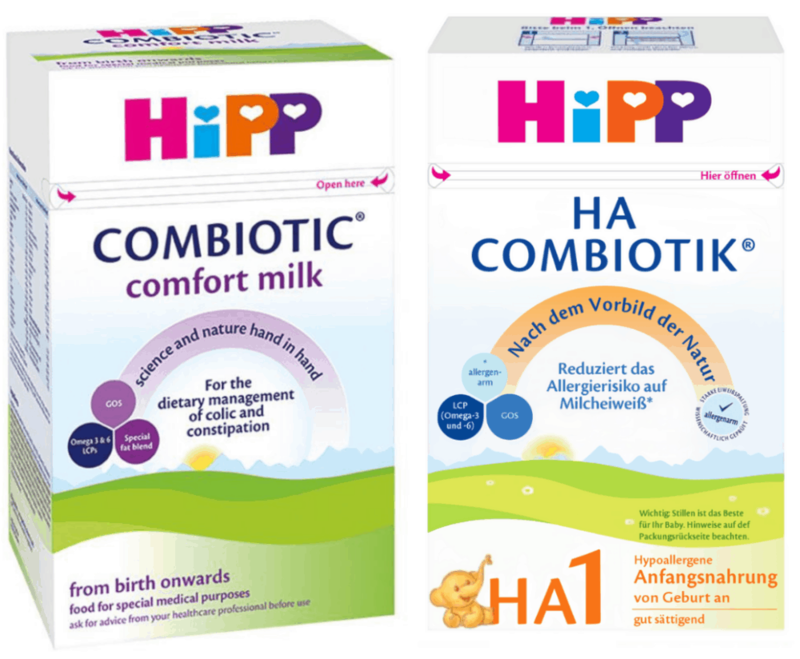 So if your little one is allergic to cow’s milk protein, I’d definitely recommend trying HiPP Comfort or HiPP HA before any of the US based hypoallergenic formulas. As for where to purchase these formulas, I’m in personal contact with the owners of all 4 of these companies: Organic Start (and Organic Start Wholesale), Dutch Expat Shop, BabyKindMarket, and Organic Baby Food, and I feel comfortable recommending them to you as options! I hope this post helped you navigate finding best hypoallergenic baby formulas available today. If you have any questions, don’t hesitate to leave a comment or contact me here – I respond to every message I get!